Candidates age should not be more than 30 years as on 15-01-2015. Age relaxation is applicable as per rules. Candidates must possess degree of a Bachelor of Engineering in Civil Engineering of a recognized University or its equivalent qualification recognized by the Government of Gujarat. Candidates need to Pay Rs.100/- + Postal Service Charges through Post Office. 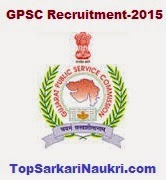 Eligible candidates may apply online through the website gpsc-ojas.guj.nic.in from 31-12-2014 by 13.00 hrs to 15-01-2015 by 13.00 hrs. 1. Before applying online, candidates must have scanned photograph & signature. 3. Click on “Apply Online” —> “Apply Now” beside the desired post. 4. Fill all the mandatory details in the application form and Submit. 5. An unique Application Number will be generated, retain it for further use. 6. Edit the application form by using application number, date of birth and click on confirm button. 7. Upload scanned photograph & signature, click on confirm button. 8. Take printout of application form and retain it for future reference. Last Date for Submission of Online Applications: 15-01-2015 by 13.00 hrs.